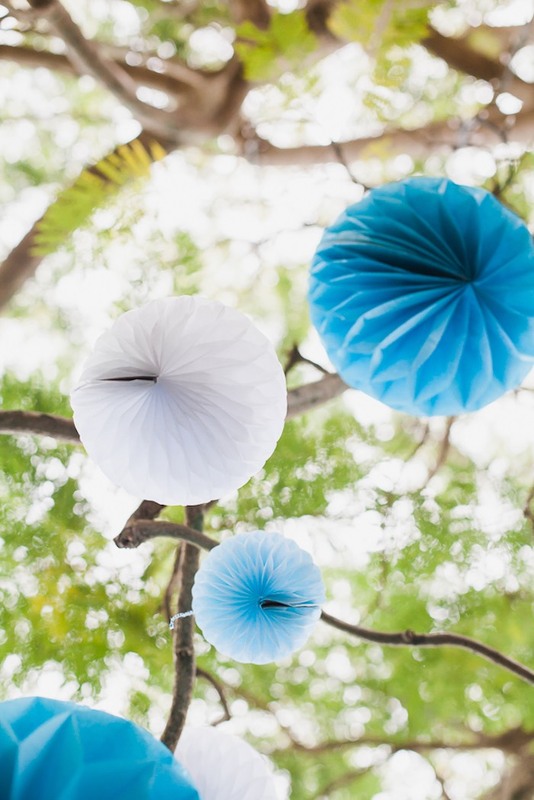 Are you looking for fun party inspiration?! 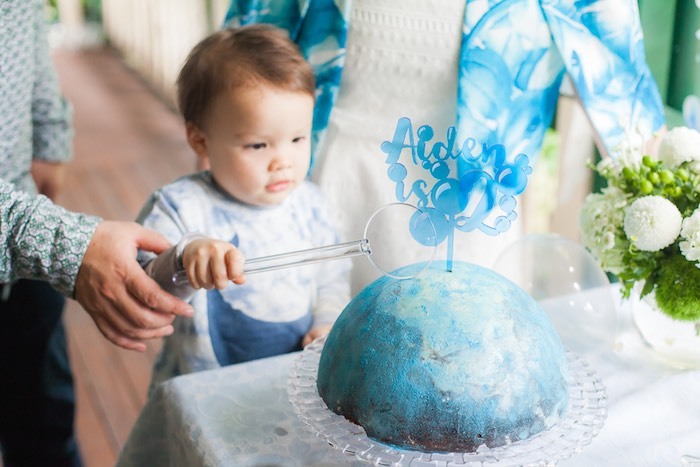 You’ll be floating in the air with this cute and unique Bubble Birthday Party submitted by Elizabeth Kelly, of ELK Prints out of Sydney/NSW/Australia! 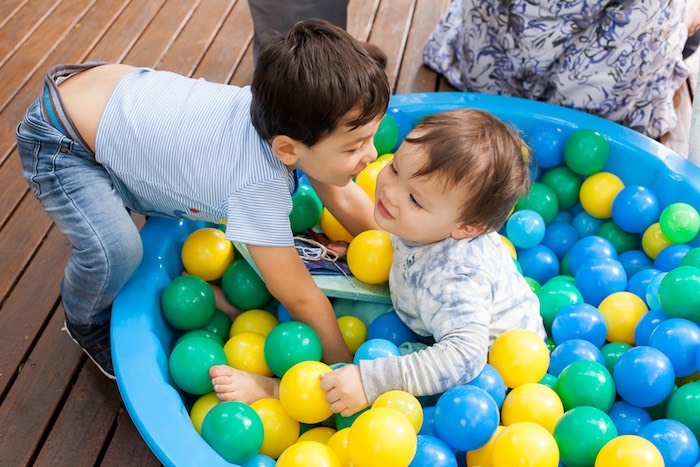 From the cute bubble stationery to the hanging honeycomb balls and colorful ball pits; this 2nd birthday celebration is simply charming! 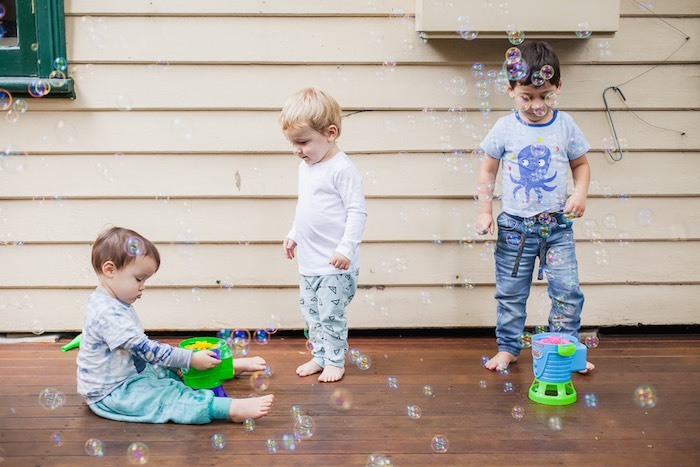 And of course…bubbles, bubbles and more bubbles! 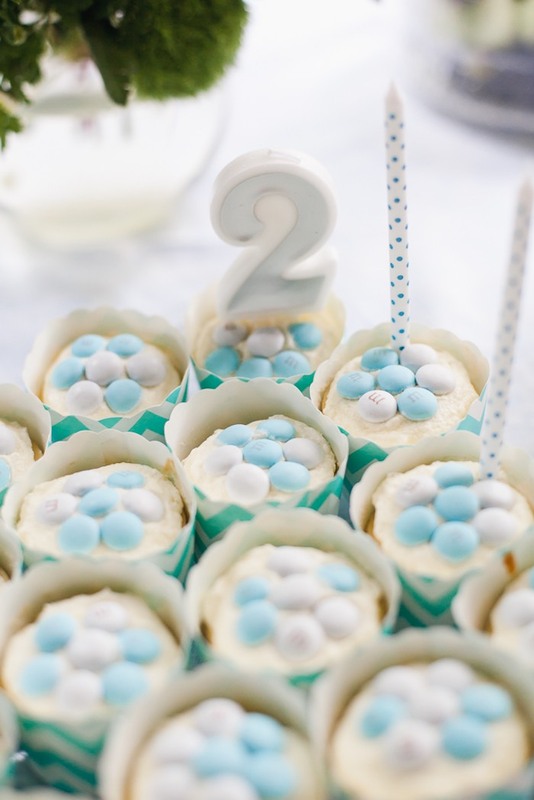 This is what Elizabeth shared about the party- “We hosted a fun and bubbly birthday party for our son Aidens second birthday party. 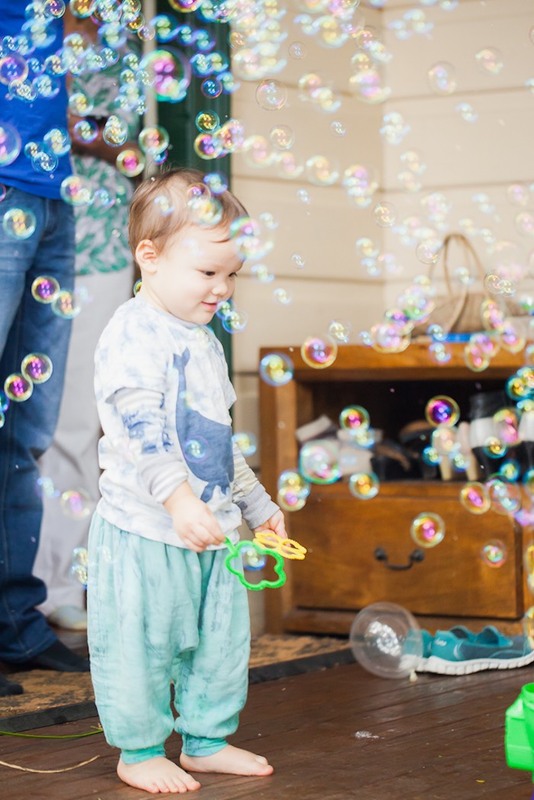 We wanted an event that was small and simple for our closest friends and family but also jam-packed with Aidens favourite things to play with – balls, balloons and bubbles. 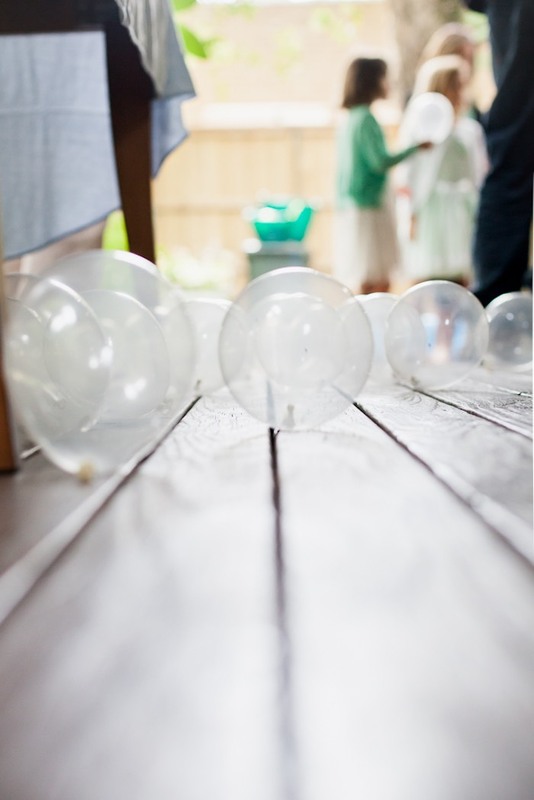 I wanted the styling to be light and bubbly, bright and fun. 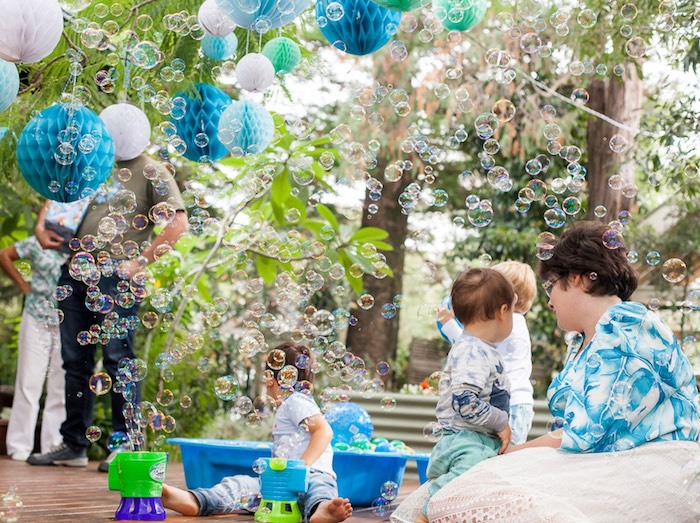 The theme we set of bubbles definitely inspired all the decor choices. 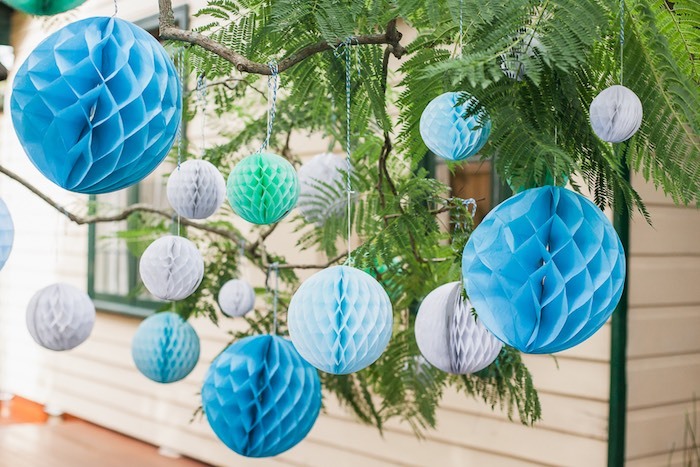 I wanted the styling to be quite simple to reflect a relaxed at home party but still create a fun impact and atmosphere for the guests to enjoy. 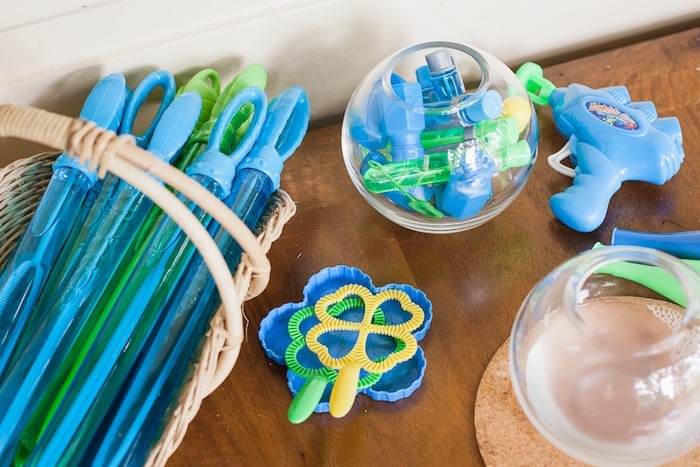 I chose a colour palette of aquatic blues and greens as it was light and bright and reflected his love of waterplay. 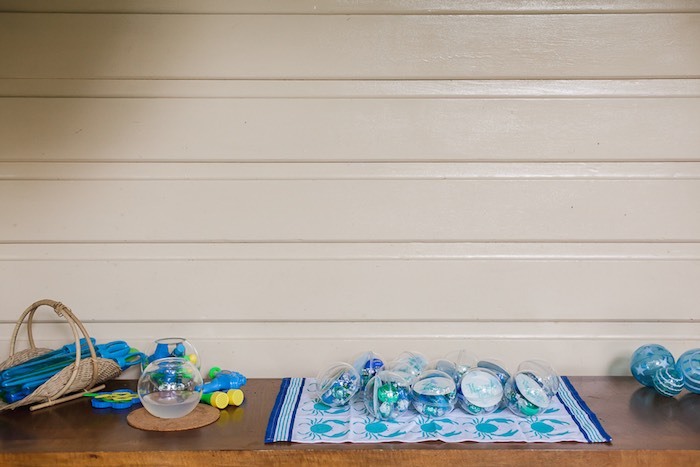 Bubbles themselves are light and airy, translucent and colourful when hit by light and reminiscent of sky and water. 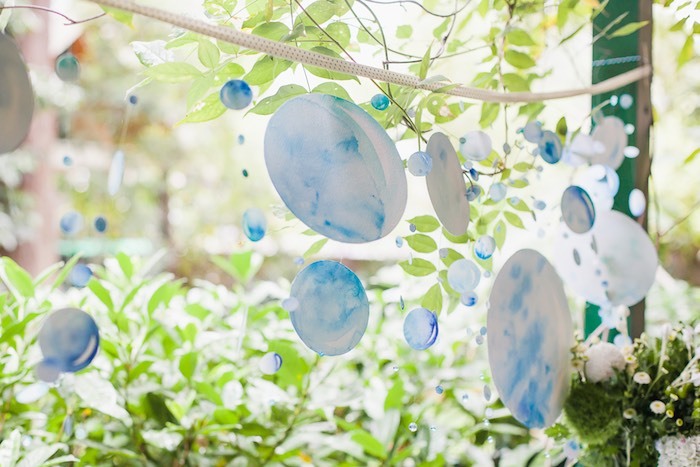 I am a graphic designer and watercolour illustrator so I was able to create beautiful party decorations myself that were all hand-painted with watercolours. 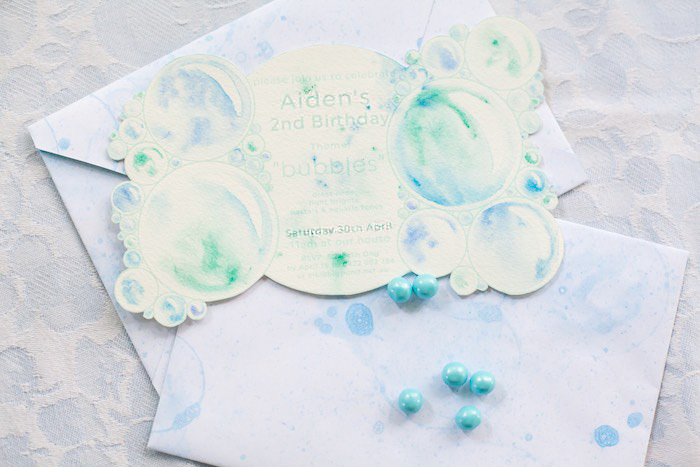 The flow and texture of the watercolour paint also became part of the colour palette, capturing that ephemeral movement of bubbles. 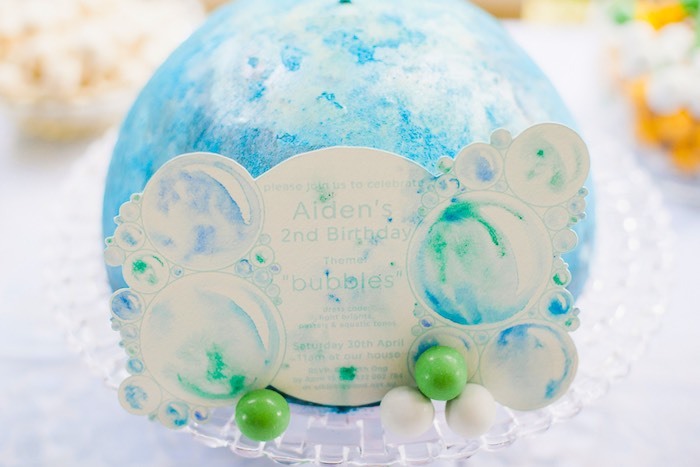 We also used lots of transparent colours, glass plates and dishes and balloons as they also captured the essence of a bubble. I even managed to source some interesting bubble-inspired flowers at my local florist – ball shaped chrysanthemums, trick carnations, hydrangeas, berries and button daisies. The spherical shapes and colours of these flowers reflected the bubble theme well. 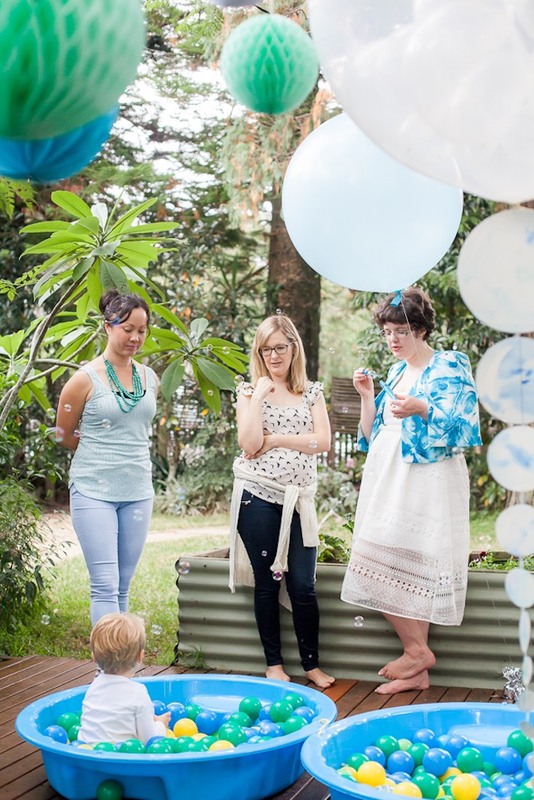 We held the party on our verandah so we had lots of beautiful big balloons set up and tiny balloons running around on the ground like little bubbles. 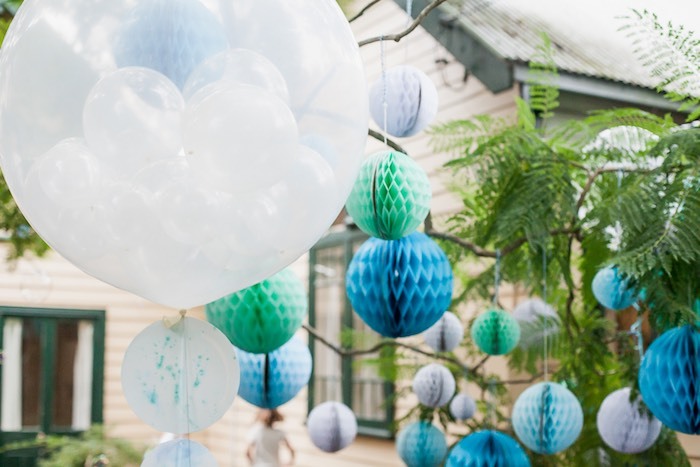 On the adjacent deck we set up a ball pit in a clamshell and in the trees above hung honeycomb balls in different colours and sizes to look like bubbles. 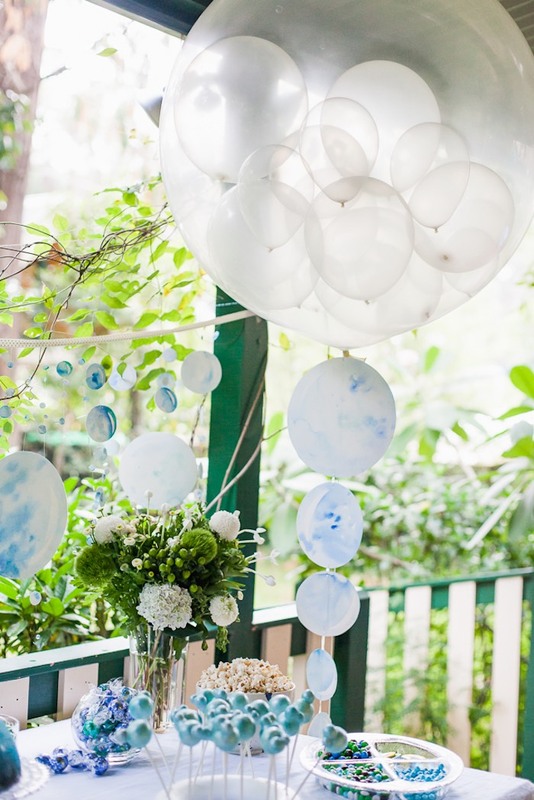 I made a special hand-painted watercolour bunting of bubbles to hang behind the dessert table as well as a garland for the big feature balloon made by Shannon Kifford from Born to Party. 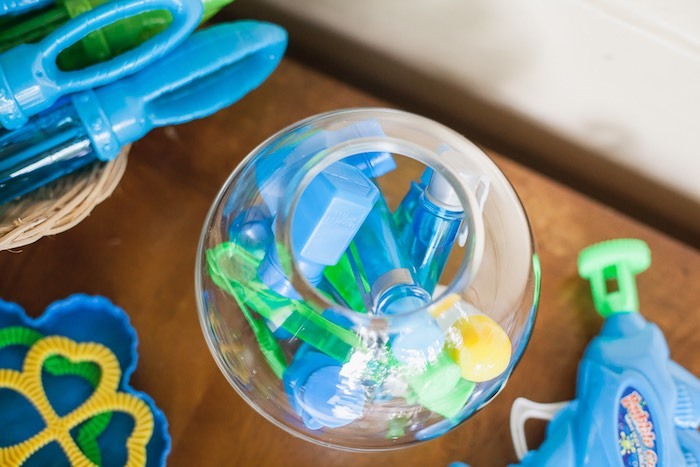 The final touch was a table of bubble wands/blowers and bubble machines so that bubbles would pump out throughout the party. My business is ELK Prints and I specialise in handmade and individually hand-painted watercolour styling piece for parties. For Aidens Birthday I made a 2 metre length of bunting. 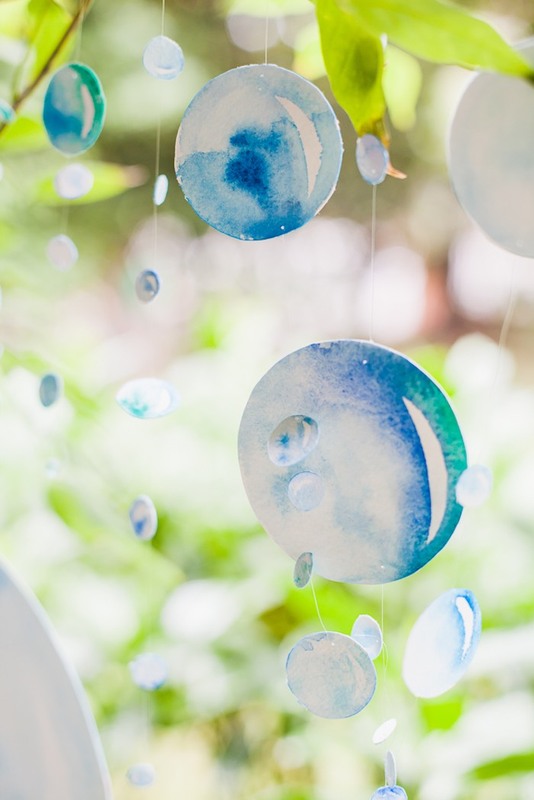 It comprises of hundreds of individually painted circles strung on transparent fishing wire. 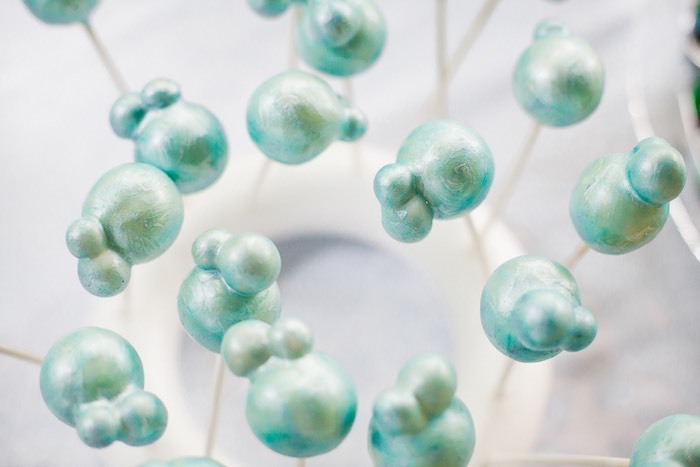 It was a nightmare to make as the fishing wire tangles easily and each circle was painted on both sides so they could twist and turn with the breeze, each drop was finished off with little glass beads. 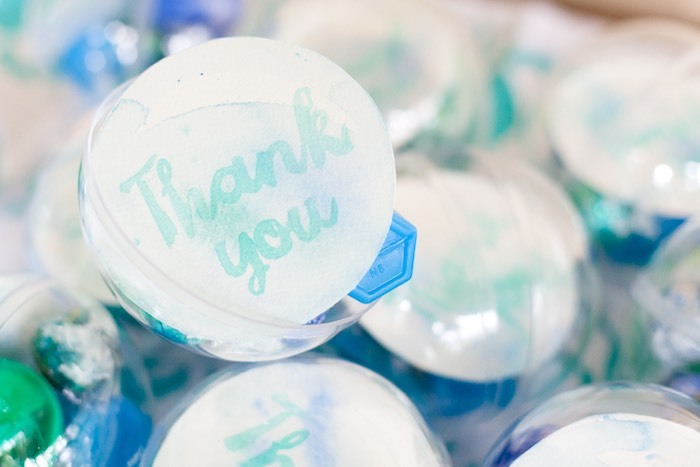 I also made the matching balloon garland and thank you cards for guests. 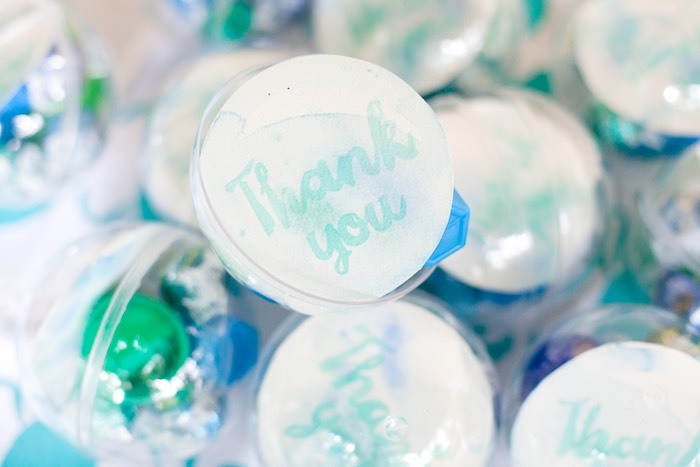 I think the guests expected some wow from the moment they received their invites in the mail. 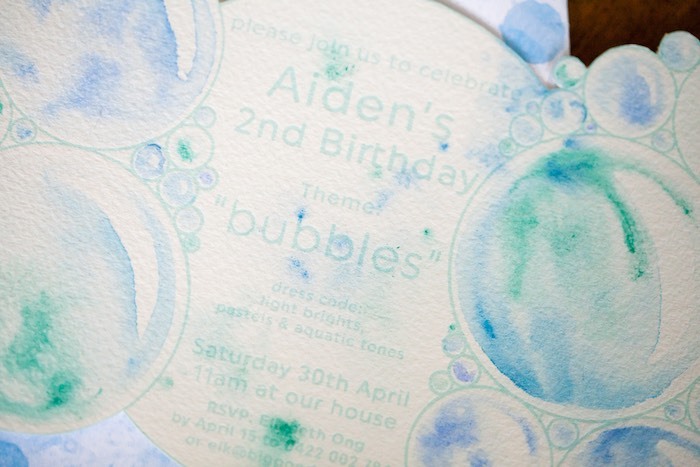 I went OTT in designing the bubble themed invites. Id been wanting to work with incorporating letterpress and watercolours together for awhile now so I found a great local letterpress studio called Olive and the Volcano who did the letterpress printing of my design before I finished it off with hand-painted watercolour details and die cut them. 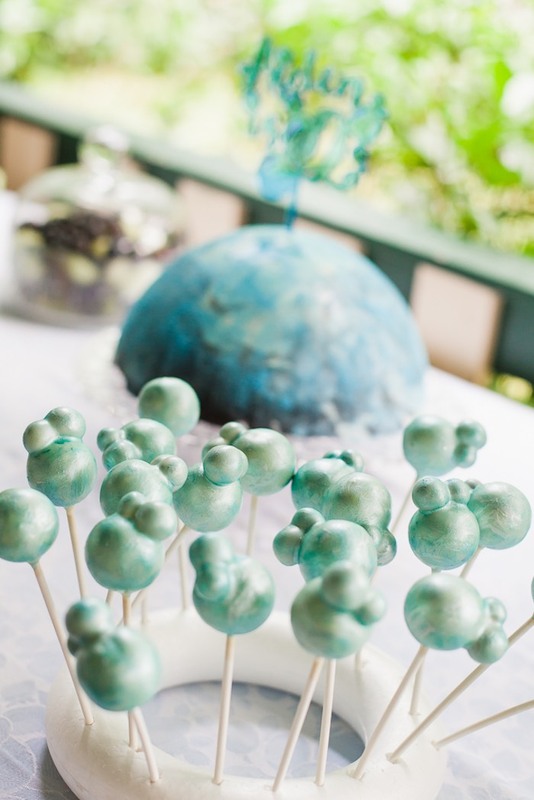 At the event itself guests loved how the theme was carried out across all the little details. 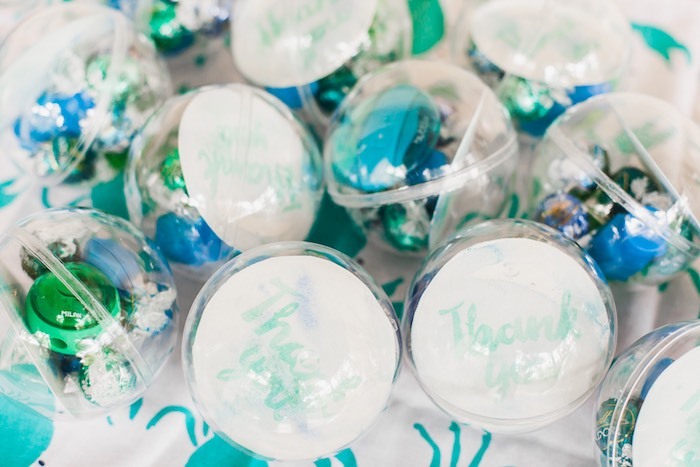 The guests were all given favour boxes to take home that were perspex spheres filled with lindt chocolate balls in aquatic coloured wrappers, a bubble shaped eraser/sharpener and bubble wand. 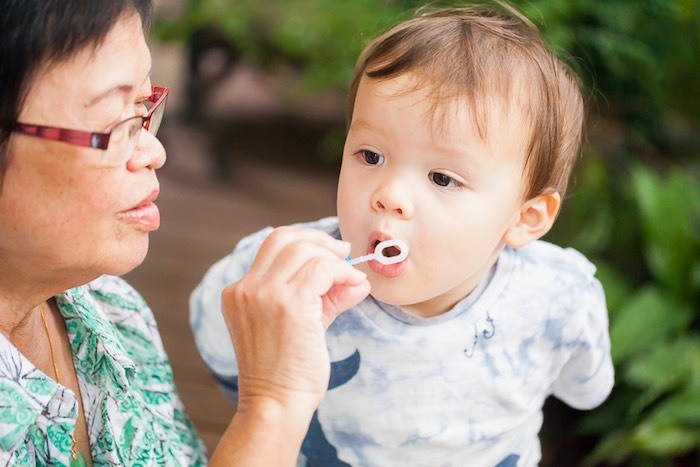 The selection worked well given that the guests were a mix of adults and children of differing ages. 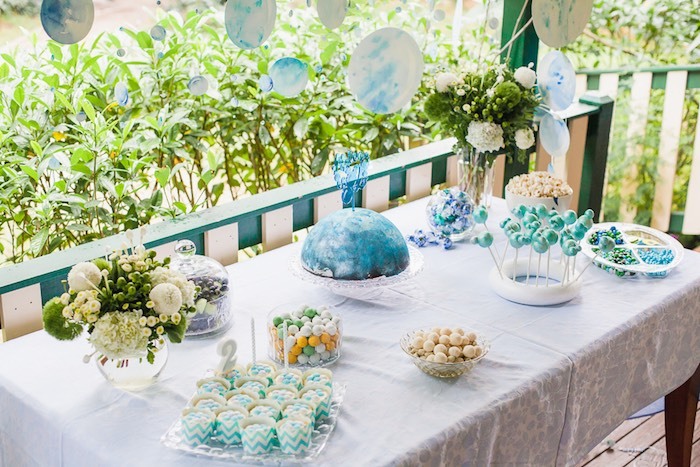 We had fun making things for the dessert table that matched the theme; A fruit salad of blueberries, grapes and honeydew melon balls, cake pops, popcorn, chocolate balls and cupcakes. 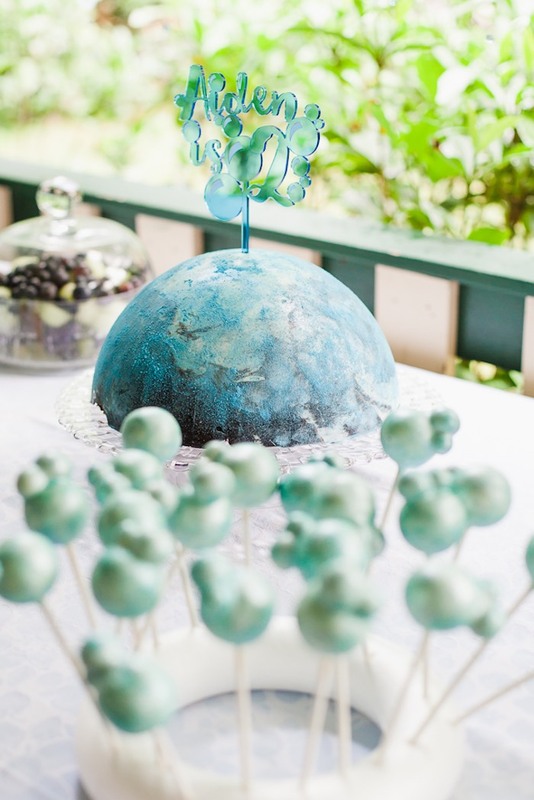 For the main birthday cake I made a dome shaped citrus spiced tea cake beneath a chocolate dome shell that was given a dusting of blue petal sugar to give it that bubble look. 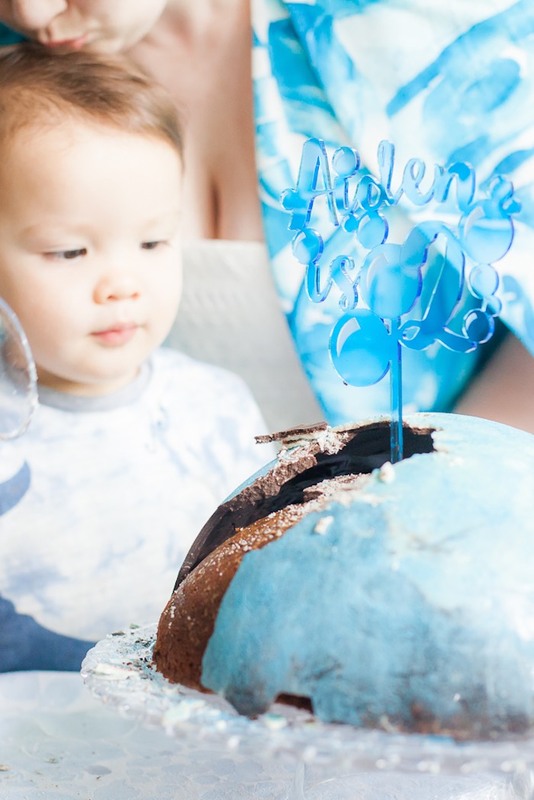 Aiden cracked it open like a piñata and he also had candles to blow out on the cupcakes my friend made. 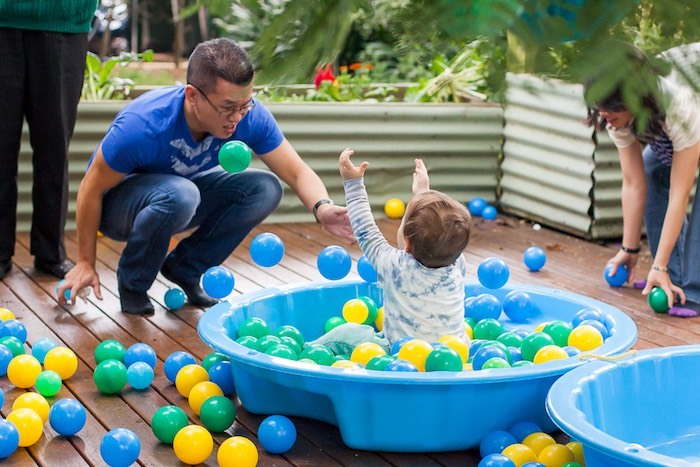 My favourite moments of the party were seeing Aiden playing and enjoying himself. 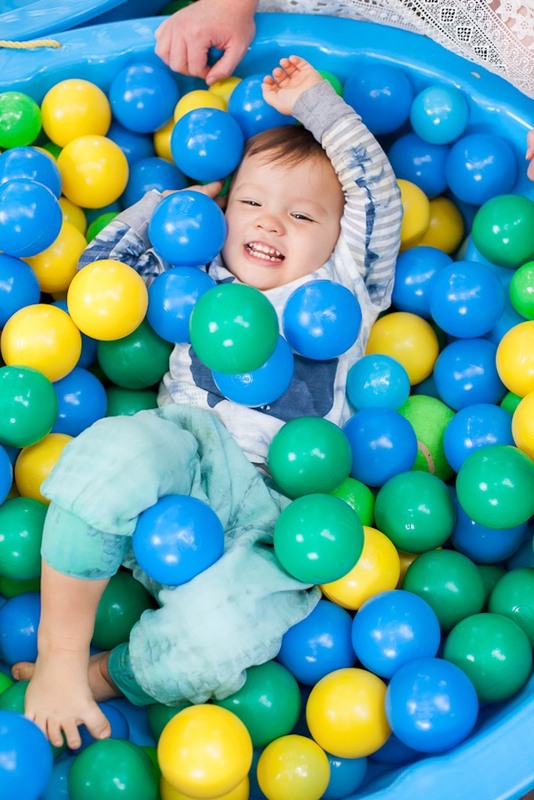 At times it was overwhelming and he snuck inside to chill out before running back out to dive into the ballpit and just roll in the balls looking up at the balloons. 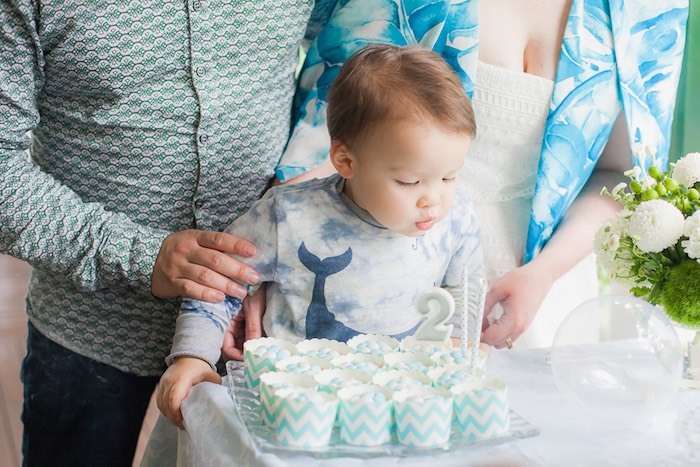 The birthday boy’s excitement built up during the days preceding the party by watching all the preparations.